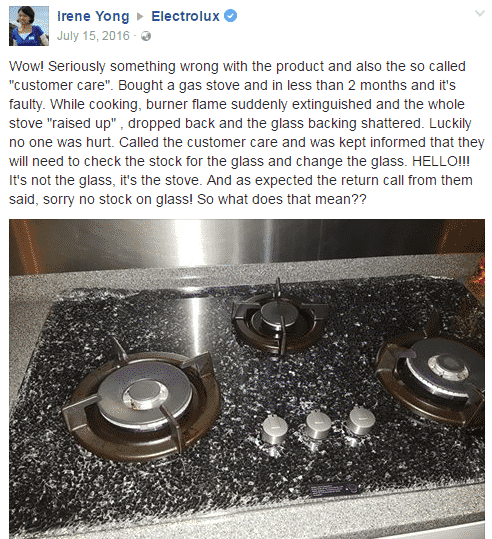 Homeowners with Electrolux gas stoves, please take note. 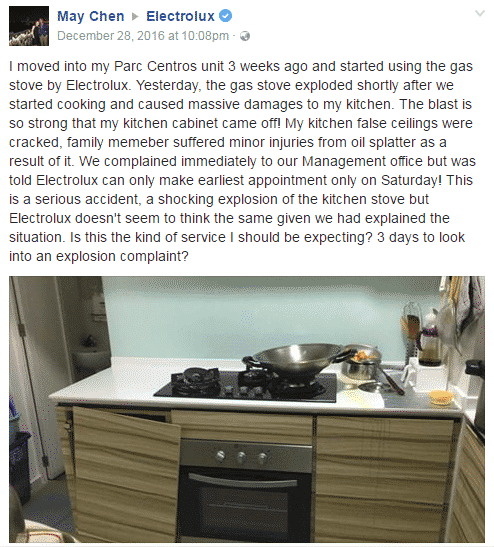 If you bought an Electrolux gas cooker hob sometime between 2014 to 2016 and it’s one of these affected models – EGT9637CKP, EGT7637EGP, EGT7637CKP and EGT7627CKP, stop using the stove immediately. 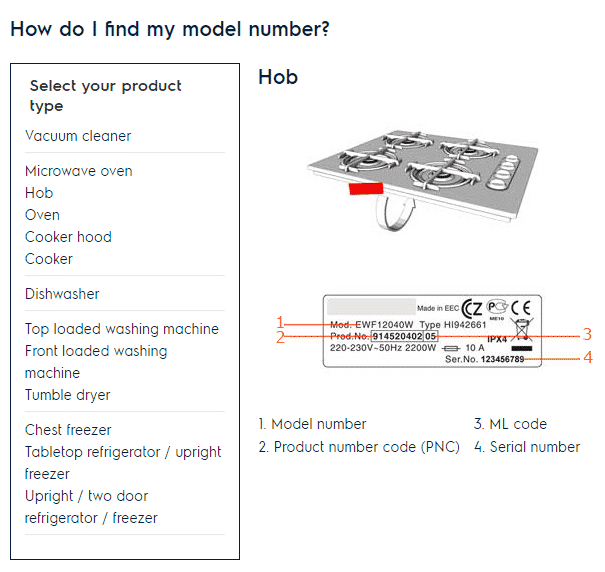 If you don’t know where to find your model number, look below the stove. For those with drawers below your stove, you need to remove the drawer to see the back of the stove. 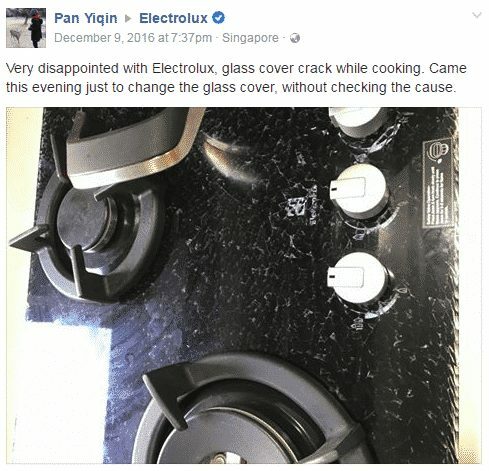 Spring Singapore warned this morning that the above models of glass gas cooker hobs by Electrolux could potentially explode. According to Spring, a user has been scalded by the cooker hob explosion. Electrolux apologised for causing any inconvenience and said that consumers with affected models should contact them by email ([email protected]) or phone (6727 3614 or 6727 3699). In fact, Electrolux has been working closely with Spring on this matter since April last year. Check out some of the complaints on their Facebook page posted in 2016. In the latest Facebook note published by Electrolux, they are in contact with property developers to look at product refunds for residents. 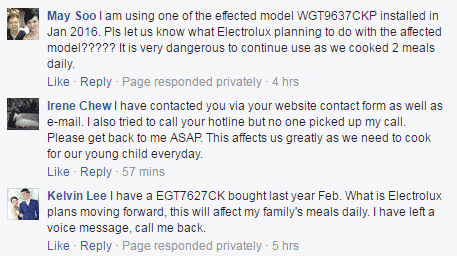 Some netizens have expressed their displeasure towards Electrolux’s customer service after calling the hotline and being kept on hold for more than 30 minutes. Some families need to cook for their young children. Crisis management 101: If management decides to issue public statement, company must be prepared to handle overwhelming calls/email. Company should also provide alternative solutions (in this case, perhaps loan portable stoves for families who need to cook for young kids or old folks). There is also a need to assess the severity of an issue and address it as soon as possible. The more serious it is, the more companies shouldn’t take their time (i.e. more than six months) to communicate and solve the issue. These steps are important for damage control. If they don’t do it properly, it will add fuel to the fire. Electrolux, the pressure is on. I am having problems with an Electrolux washing machine. Every now and then, it refuses to switch off and runs for Hours. To get round the problem of contacting customer service, Harvey Norman, where I bought the machine, suggested I call its outlet and their people get in touch with Electrolux for me.